Ladakh in recent times came up as one of the most desired tourist destinations of our country. It is now no longer the challenging and “considered dangerous” region; where only the motorcycle enthusiasts and adventure junkies dared to go. Now it is a place where even families visit for vacations with children and their elders. I even have had a few people asking about if they could plan their honeymoon in Ladakh. Everyone is talking about visiting Ladakh these days; and 7 days is usually the most common time frame that gets considered for the trip. If you too have been thinking about making a trip in similar manner, then in this article I will share a few examples of Ladakh one week itinerary. I will first detail an itinerary that I recommend; followed by a few other ways that the same journey can be done. If, after reading the article, you have any questions, you may comment and ask towards the bottom of this page. With 7 days in hand, the most important thing you got to remember is that it cannot be a road trip. You will have to catch a flight in and out of Leh city; and use 7 days to explore only Ladakh. A journey on Manali Leh and Srinagar Leh highway would have to be left out for another trip at another time; when you would be able to spare a few more days for the journey. For a road trip, 9 days is the bare minimum time needed. Trying to squeeze it in 7 days would only mean that you spent most of your time on the road; and missed out on several must visit areas in Ladakh. If you were thinking about making a bike trip to Ladakh in 7 days from your home town (or even by car); then scroll towards the end of this article straight. I have covered this information in detail there. Mentioned below is the simplest and the easiest Ladakh itinerary for 7 days. Now the itinerary above will have you spend all 7 days in Ladakh itself; and fly out of there on Day 8. If you were however looking for a tour plan where you can reach home on Day 7 itself, then I recommend you take a look at The Best Itinerary to Visit Ladakh in 6 Days. This plan will have you sight-see in Ladakh for 6 days and fly out on Day 7. Now coming back to our 7 days itinerary, the reason why I am recommending traveling this way is because it is doable irrespective of your mode of travel. Once you land in Leh city, there are three ways that you can move around locally in Ladakh. One is that you hire a private taxi which is the best way but will also cost you a lot of money for 7 days. Second is that you rent a motorcycle which will be a bit cheaper than private taxi but is not everyone’s cup of tea. It is a good option it you were traveling with friends and know how to handle a motorcycle in the hills. But for people who have no experience in riding or were traveling with family, a bike is not really much of a choice. Which then brings us to the last and most cost effective mode of travel, public transport. It is a great choice for people who are either traveling on budget, can’t afford a private taxi or are not too familiar with motorcycles. Public transport here comes in the form of Bus or shared taxis; both of which are available from Leh bus stand. Now let me run down this plan day by day for better understanding. The biggest concern for people flying into Ladakh is of altitude sickness; also known as acute mountain sickness, or simply as AMS. Think of it like this; one moment you are in your home town in plains, and then in a matter of couple of hours, you bring your body to an altitude of 3,500 meters in Leh city. This tremendous gain in elevation is too sudden for our bodies to cope with and hence triggers the symptoms of AMS. Slow gain in altitude is the key towards avoiding mountain sickness which doesn’t happen in this case. Unfortunately there isn’t much you can do about it. Majority of the people would suffer from AMS on Day 1 of their trip. Some people continue to feel the symptoms on Day 2 as well. Plenty of rest and not exhausting yourself then becomes the trick. After you land in Leh, go straight to your hotel and rest. Do not run around exhausting yourself and wait for the AMS to subside. Chances are that by evening you should be feeling OK and well enough for some sightseeing in the town. If your condition continues to worsen, please see medical assistance at a hospital nearby. For some quick tips on avoiding AMS, please read How to Handle Acute Mountain Sickness in Ladakh. Once you land in Leh city in the morning, head straight to your hotel. If you were renting a private taxi, then ask the driver to come pick your from the airport itself. If not, then you will easily find a cab from the airport to your hotel. It has started to get a bit crowded in Leh these days during peak tourist season so I would recommend that you book your stay here in advance if visiting in June, July, August or September. For a list of some recommended budget hotels in Leh, please read List of Good Budget Hotels in Leh. Your most important task for this day would be to arrange permits for visiting other areas in Ladakh. This permit is called Inner Line Permit and can be obtained from DM city in Leh in person; or online. For more details on how to get the permit, please read How to Obtain Inner Line Permit for Ladakh. Once you have the permits, take rest and let your body acclimatize to high altitude. If you are feeling better by evening, then you can take a visit to some of the local tourist attractions in the town. For a list of places you can see here, please read Tourist Places in Leh City. If you were traveling by either a private taxi or rented bike, then you should get an early start from Leh. This would give you ample of time for sightseeing in Nubra Valley. Total travel time from Leh to Diskit can be about 6 to 7 hours depending upon your speed and breaks. Monastery in Diskit, Hunder sand dunes, Panamik hot water springs and Bactrian camel are some of the must visit places in Nubra. Accommodation is available at almost all the villages here but I will recommend staying at either Diskit or Hunder. If you want, you can also travel all the way to Turtuk and stay there for the night; but that is another 4-5 hours from Diskit so plan accordingly. Roads are mostly good except for a rough patch around Khardung La top, between South and North Pullu. For accommodation in Nubra Valley, Please read Hotels and Guest Houses in Nubra Valley. For a list of places that you should visit there, please read Tourist Attractions in Nubra Valley. If you were traveling by public transport then shared taxis from Leh Bus stand to Diskit start everyday in the morning. Just make sure you reach there at around 7 AM. Buses do not operate everyday but shared taxis do. If you find a bus, then board it; otherwise look for a shared cab. On Day 3, you will return to Leh by the same road across Khardung La. If you reached there by Bus, then the same bus will return to Leh the next day that you can board. For a shared taxi, then just go to Diskit bus stand and find a shared cab coming towards Leh. If however you are by rented motorcycle or private cab, then take the turn towards Panamik from Khalsar before coming back to Leh. In Panamik, you can see the hot water springs and even take a dip in the warm water if you want to. From Panamik, return to Khalsar and continue on you way back to Leh. The reason why I kept a visit to Nubra first is because it is at an even lower altitude than Leh city. So a visit here first becomes beneficial in terms of mountain sickness. By Day 3, when you return to Leh, your body would have fully acclimatized to high altitude. 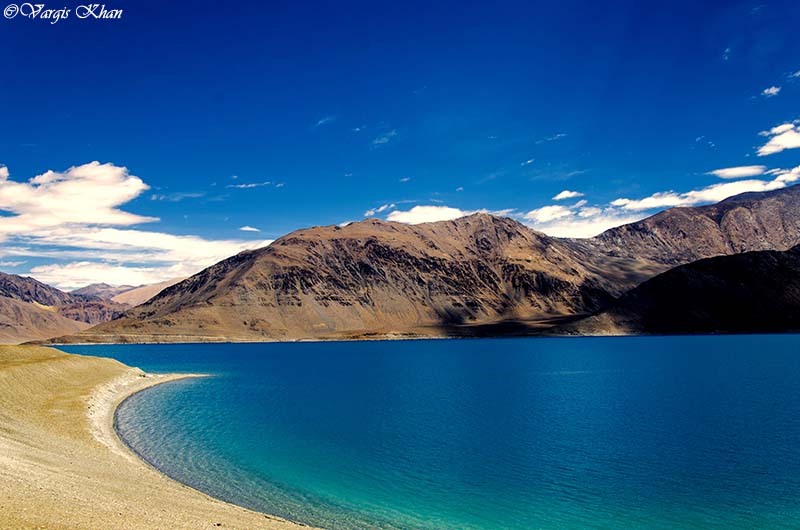 Your next destination will be the famous Pangong Lake which overtime has become the very symbol of Ladakh. Once again, if you rented a private cab or motorcycle then try to get an early start. If by public transport, then you would again have to reach Leh Bus stand and look for either a Bus to Pangong Tso; or shared tax. In peak tourist season, finding a mode of commute is not going to be too big a challenge. Total travel time would be around 6-7 hours depending upon your speed and breaks. Roads are mostly good except for a bad patch around Chang La top. Accommodation at Pangong can be camp sites, wooden huts, chadar tents or paying guest in the villages around the lake. For a list of available options, please read Accommodation Choices at Pangong Tso. You will return to Leh today by the same route that you took to get here. The bus from Leh to Pangong completes the return journey the next morning. So if you reached the lake by Bus, you can board it again in the morning for coming back to Leh. If not bus, then you will easily be able to find a shared cab from Spangmik. If you were traveling by a private taxi, then I will recommend making at short stop to visit Thiksey Monastery on the way. Next destination will be the another beautiful lake of Ladakh, Tso Moriri. Unlike Pangong however, this one is actually a fresh water lake and has wildlife around it. It also doesn’t get as crowded as Pangong. The village on the banks of the lake is called Karzok and that is where you will be heading. To get here, you will first reach Upshi and then take the route via Chumathang. Road condition is a mix of good and bad with the bad part around Polokongka La; and between Sumdo and Karzok. Travel time will be around 7 to 8 hours easily. If you were traveling by Public transport, then you will again have to reach main Leh Bus stand and look there for either a Bus or shared taxi. There are a few hotels, guest houses and camp sites in Karzok where you may can spend your night. For a list of some recommended places, please read Hotels and Guest Houses at Tso Moriri. If you were traveling by public transport then you really have no choice but to go back to Leh by the same route via Changthang. If you were however traveling by a private taxi, then I will highly recommend that for your return journey, you take the road via Tso Kar, another beautiful lake nearby. From Karzok you will first drive back to Sumdo. Then from Sumdo, you will take the diversion towards Tso Kar via Polokongka La. You will then drive across More plains to reach the lake. Take a break, spend some time here and then drive back to Leh via Tanglang La. And that will conclude your one week in Ladakh. On Day 8, you will take a flight back home. As I also mentioned previously in the article, if you were looking to return home on Day 7 itself, please please read The Best Itinerary to Visit Ladakh in 6 Days. The itinerary I explained is probably the simplest and easiest way to travel to Ladakh. You will have no problem moving between places, in finding accommodation or looking for a mode of commute. If you were however traveling by a private taxi or rented motorcycle; and are not bound to bus timings or availability of shared cabs; then the same journey can be done in numerous other ways. I will mention a few for example. In this itinerary, you will give up Tso Moriri entirely in favor of exploring Nubra Valley; and also to visit some other places on Srinagar Leh highway. On Day 1 you will arrive in Leh and arrange permits. You will then travel to Nubra Valley and stay in Diskit for Day 2. On Day 3 you will reach the far off village of Turtuk and stay there. This is the last point till where civilians are allowed. On Day 3, you will travel back to Diskit and then reach Panamik on the other side of Nubra valley. From Panamik you will travel to Pangong Tso by Agham Shyok road; without going back to Leh. After arriving back in Leh on Day 6, you will then explore Srinagar Leh highway on Day 7. Out here, you will see Magnetic Hill, Indus Zanskar Confluence, Gurudwara Patthar Sahib, Maitreya Buddha; and return to Leh by evening. For a complete list of places to see, please read Tourist Attractions on Srinagar Leh Highway. Now let us take a look at Itinerary # 3. Traveling this way, you will just spend one day in Nubra Valley; but will able to include Tso Moriri and Changthang Valley both. Once you have reached Pangong from Diskit via Shyok; you will continue traveling further on the banks of Pangong Tso. You will travel across Changthang Valley, cross the village of Chushul, and reach Hanle for the night via Loma. From Hanle, you will then travel back to Loma and reach Karzok via Nyoma, Mahe and Sumdo. You will then travel to Tso Kar as I explained previously in the article and then reach back Leh via Tanglang La. A fourth Itinerary can be as explained below. The only difference in this one is that you will give up Hanle here and add another day of exploring Nubra Valley. On Day 3, from Diskit, you will travel all the way to Turtuk and then return to Panamik for the night. On Day 5, you will travel to Karzok from Pangong straight via Chushul, Loma, Nyoma, Mahe and Sumdo; without taking the diversion towards Hanle. This were just some itineraries that I would recommend; but there are numerous other possibilities that the journey can be tweaked into. You can add or remove places as per your own liking but I will share a few more examples. This itinerary will have you explore Srinagar Leh highway all the way till Kargil. You will reach Kargil via Lamayuru and stay the night. Next day you will return to Leh but will take Batalik route for the return journey. With this itinerary, you will give up Tso Moriri entirely and add another day in Nubra valley. This will however also mean that your journey will be much easier and at a relaxed pace. There will be no long travel hours involved and it will feel more like a vacation. I will recommend this itinerary specially if you went with your family. This itinerary is recommended only if your main motive of the trip was Zanskar valley. This is only for someone has already covered Ladakh and want to explore Zanskar now. From Leh you will reach Kargil on Day 2 and then travel to Padum in Zanskar valley on Day 3. After spending a day there, you will then travel back to Leh via Kargil and Batalik. This is another itinerary that I will highly recommend for traveling with family. Your journey will be relaxed and you will not travel on bad roads anywhere. The route between Pangong to Moriri via Chushul is a bit bad which will avoided in this plan. Lastly I will also recommend an itinerary if you were in Leh for only 6 days and had to catch a flight out on Day 7. This is basically same as the previous one. The only difference is that you will skip the Lamayuru route and focus only on major tourist routes in Ladakh. It will be extremely hard to make this entirely a bike trip or car trip in 7 days from your home town. Your journey will be rushed and you will be missing out on majority of the must visit places. Think of it this way; Srinagar to Leh and Manali to Leh is at least a 2 days journey. Then you will need another 2 days at least for getting to either Srinagar or Manali from your home town; and then going back home. One day would be needed in Leh for arranging permits so 7 days of your trip are gone right here; not leaving you with even a single day for sightseeing in Ladakh. So in a nutshell, you will barely touch Ladakh and come back. Even for this, farthest that you can be living is Chandigarh or Delhi; or someplace at a similar distance. Srinagar would still have to be left out and you will have to go via Manali and come back the same way. The permit for Rohtang Pass would have to be arranged well in advance so that you do not have to spend a day in Manali arranging it. Your itinerary would pan out something like this. I am sure the above mentioned is not the trip you were thinking of. A 7 day road trip to Ladakh is mostly done from Manali only; Manali to Manali in 7 days. So in order to make a road trip to Ladakh, minimum number of days you would need is 9. Any less than that and you can’t do it. I hope the information above on traveling to Ladakh in one week was of help. If you have any other questions; or need further clarification on any part; please feel free to ask in the comments section below; or at our Community Forum; and I will be glad to answer.